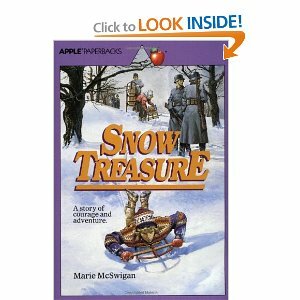 " Snow Treasure" by Marie McSwigan is an exciting, suspenseful tale of Norwegian children and their contributions to protecting their town's gold during the German occupation in 1940. Convinced that the Germans will try to steal their town's considerable wealth of gold bouillon from the banks, the townsmen decide that it must be removed. Since a group of adults can't remove the gold without the Germans finding out, the townsmen develop a daring plan involving the children. Various problems arise as the children begin to carry out this plan. the How the children can bring the gold from its hiding place in the mountains down to the harbor without the German soldiers stopping them. Good opportunity to explain about weather as this takes place in the winter with snow all around. How can you use the snow as part of the plan?